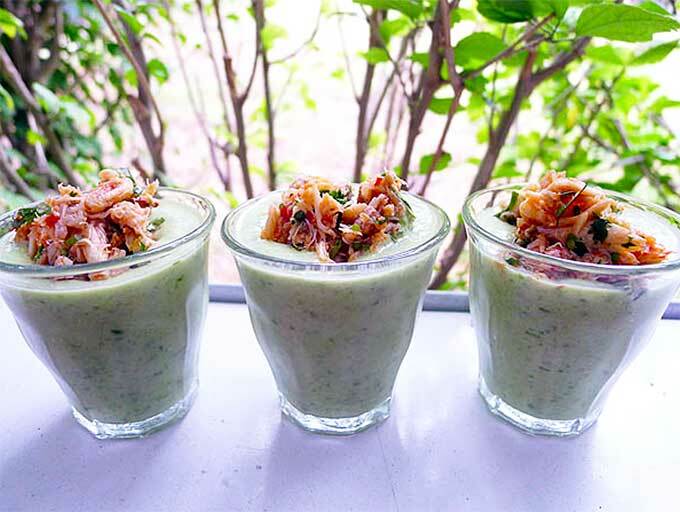 Chilled cucumber soup shots with spicy crab are cool and creamy with the use of avocado and coconut cream, Dairy free, it is the perfect easy cucumber soup recipe for summer entertaining. The soup shots can be made vegan by omitting the crab and using tofu. Everyone is a winner! Summer in Australia is hot, don’t let anybody tell you differently. It’s also the time that Aussies love to entertain. Relaxed barbeques at home, accompanied by cooling beverages, lasting until the heat of the day is put to bed by the arrival of evening. Our hot Summer days do cry out for barbeques, but cooling dishes for entertaining are also an essential requisite for any serious home cooks’ repertoire. Another recipe that I am not 100% sure where I nabbed it from, maybe Delicious? I originally made these for Christmas Day back in 2012, and since have used it in cooking demonstrations. The recipe has been a huge hit with family and strangers alike. Amazed how easy this canape is to make, and how flavour packed it is. Why not try my Chilled Corn Soup with Crab and Gin Pickled Tomatoes! The chilled cucumber soup looks great in a shot glass. Topped simply with spicy crab meat it is a chilled flavour bomb. The beauty of this recipe is that you don’t have to make shots, you could quite as easily prepare larger versions of this cooling soup in bowls or larger glasses. Not sure if you like chilled soup? Quite a few people are put off by the idea This is the perfect chilled soup introduction recipe to see if chilled soup is for you. There is wiggle room with this recipe. Chopped cooked prawn or lobster can replace the crab. Don’t want to use shellfish? Finely shredded poached chicken works a treat. For a vegan chilled cucumber soup, some crispy tofu is magical. None, it all goes in a blender and whizzzzz. Again none, you will need a blender. You could get away with a stick blender in a pinch, but a blender with a jug is the way to go. Buy picked crab meat from your local fishmonger. There is no need to buy crabs and pick the meat yourself. This is meant to be an easy cold cucumber soup recipe for entertaining after all! This is a devour on the day kind of recipe. The cold cucumber soup does not freeze well. Any leftover spicy crab can be used the next day in a salad. Do tell! Are you a fan of chilled soup? Or do you feel soup should remain a warming dish for winter? 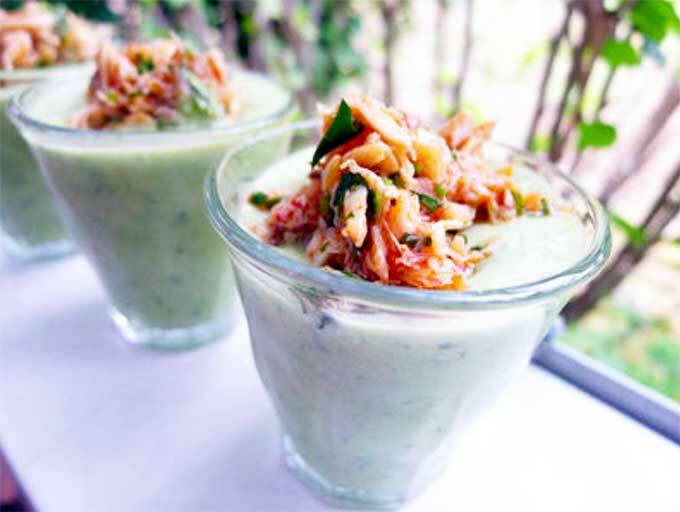 Chilled cucumber soup shots with spicy crab, creamy with the use of avocado and coconut cream. Dairy free, and can be vegan by replacing crab with tofu. 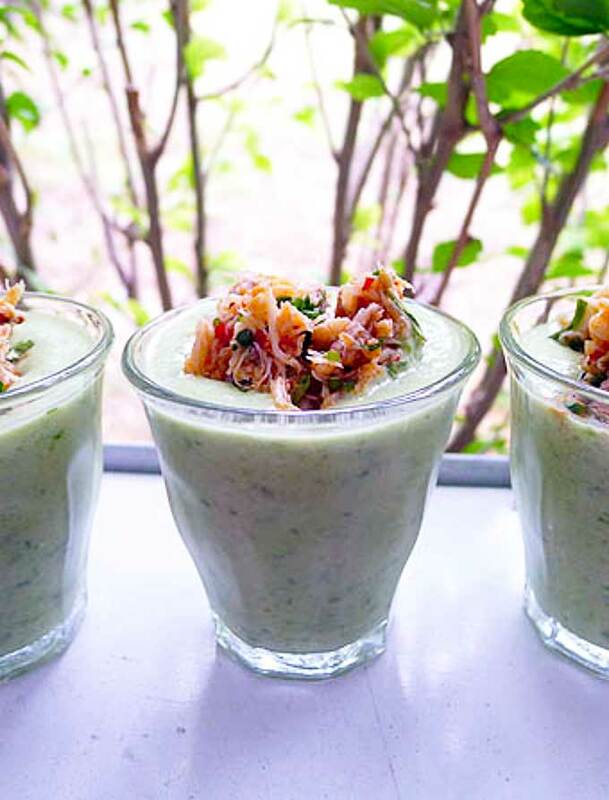 In a blender place cucumber, avocado, spring onion, 2T of lime juice and 2T of coriander with 1 cup of iced water. Season with salt and ground pepper, then blend until smooth. Transfer to a large jug and stir in the coconut cream. Taste and adjust seasoning if necessary. Place in fridge and chill for at least 30 minutes. In a bowl combine canola oil, sambal oelek, crab, remaining lime juice and coriander. Season with salt. When ready to serve, divide the soup into your 8 shot glasses (or small bowls). Top with a spoonful of the spicy crab mixture and serve immediately. LOVE the concept! I would definitely eat this and I don’t even like soup. Perfect for my audience too! Sharing. Loving the sound of these Sara, what a quick and simple treat – and anything with avocado, cucumber, crab and chilli wins in my bood! LOVE this recipe! So easy and it looks super refreshing. Everything in there are my my favourite ingredients and love seafood. Great recipe Sara, definitely will try this out before summer is over. Thanks so much, hope you enjoy it if you do end up making it. The avo in this really makes it and gives a lot to the cucumber. I agree Lorraine, they would be perfect for Australia Day. I’m not that used to chilled soups but this one looks amazing! Craving one right one. They look so lovely!! I’ve only had cucumber soup ones and I quite enjoyed it! I think these will be perfect for a special lunch coming up next week. I love how you’ve presented it in glasses. Love the presentation! I prefer my soups warm but am partial to a cold vichyssoise or a gazpacho in small amounts, especially in 40 degree weather! I am like you, prefer warm to cold, unless in small amounts.